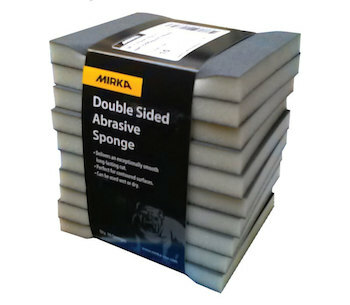 Mirka Sanding sponges are made of Resin Bond cloth coated with a tough abrasive and laminated to a flexible 3/8” thick sponge. It can be used for all types of sanding jobs (metal or wood surfaces), with maximum handling comfort from the three sponge sides. Works efficiently on contoured, flat and hard-to-reach surfaces. Reusable - simply rinse clean and squeeze. 4" x 5" x 1/2", 220 grit.